I’ve stated many times that, for me, rum enjoyment begins not in the glass, but on the shelf. While you can’t judge a book by its cover, packaging matters. Rums like Diplomático Reserva Exclusiva clearly understand this truth – from its squat, frosted bottle to the montone, duty-stamp label this is a rum designed to convey a product that’s traveled a great distance, and a great exapanse of time, to find its way into your eager hands. In the glass, Diplomático is a deep, rich amber, while to the nose it bears the deeply sweet, syrupy quality indicative of fine, South American rums – less about oak and musk, and more about overripe fruit, vanilla, and clove. Upon tasting, Diplomático is full and candylike. Surprisingly approachable, it brings a heady, desert-like quality reminiscent of candied fruit, and reminding me strongly of the much hailed Ron Zacapa 23. 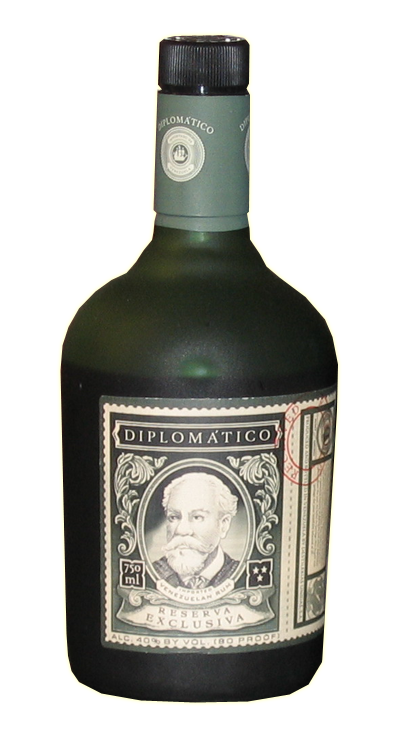 Fans of sweeter, more liquour-like rums should definitely give Diplomático Reserva Exclusiva a go. It’s hardly the “in your face gunpowder goes boom” experience I personally enjoy in my favorite rums, but it’s an excellent drink in its own respects. This entry was posted in Rum and tagged diplomatico by Bilgemunky. Bookmark the permalink. Great to see you reviewing a rum again. I know exactly what you mean about the diffuser. I spent quite a bit on a bottle Ron Santiago Añejo Superior Rum 11 Años Cuban Rum, and it is a really nice cuban rum. But it’s got a cheap lid, and a plastic diffuser. When you’re paying that much, you expect a damn cork! Something you can pull out with your teeth. Aye, it occurred to me that it’s been a while since I’ve done a rum review. Wasn’t intentional, just somehow managed to not review rum for several months. I’m on board with your review of this rum. It ain’t bad, but a bit sweet. Now the diffuser … that’s why I won’t buy another bottle of Diplomatico. The makers need to show a little pride and class and stick a darn cork in it. I dont see what the issue with the diffuser is, who cares. Its like going to your dive food joint. You know it looks like crap, but its whats inside that keeps you coming back. However, I need to say that Diplomático Reserva Exclusiva is not my rum of choice. Eventhough the falavors up front are great, the overbarring of mint or earthy flavors make me run away from it. I leave this rum for mixings in my wifes drinks, because I can not think of it touching my lips. I hope other Venezuela rums are better. Just opened a bottle of Diplomatico Reserva (not the exclusiva). This one is a cork top with no diffuser.